Good Morning Tom and Justin! Wanted to send along our Christmas letter. (yes, it is a little long, but we had a lot to share!) You both have been so valuable to our family. We are so grateful for your ethics and values, quality and dedication to your customers. We hope your family had a wonderful Christmas and New Year! 2017: Sold house, hired builder, lived nomadically with parents, fired evil first builder, hired wonderful second builder, broke ground in October. The home building process involved quite the learning curve. We began the journey with wrong builder, which delayed our process by about 5-6 months. However, we were fortunate to find TJB Homes (www.tjbhomes.com). They were wonderful to work with and built us a beautiful and quality home. If you are looking to build a home in the Twin Cities area, we can’t recommend them highly enough! It hardly seems possible, but we've been at 1065 Shryer for five months now. We feel settled in and love the home. We want to thank all of you for everything you did, from breaking ground to closing, and afterward. I read somewhere that one of the most stressful things in life is moving. We certainly felt overwhelmed at times, but with all of you on our team we knew that everything would be great. We love our new house! It is built with quality and it really feels like it summer or winter. When we started partnering with TJB I really wasn't sure if we could sell our house that was underwater, plus I was concerned out the condition of our house as well. From the get-go the TJB family made us feel very welcome, settle any nervousness that we had, and also helped us feel,comfortable asking a lot of obvious questions. Over some time we then moved onto the planning and build process and TJB stayed consistent always helping, always communicating, and ensuring all bases were covered. We had never reviewed house plans before yet alone helped with so e of the principal design ideas. TJB helped make it an easy and workable process. Our house was completed on time and on budget according to the targets that we agreed to. Following the building of the house their willingness and openness to follow-up questions really resonated with my family as well. Water softener questions, smoke alarms, how-to questions with the awesome windows, garage door opener, cabinet door questions...these are all product questions. We had them. The builder, TJB HELPED us with these questions as well! In the end we would recommend this builder due to the quality build process they employ, the openness to work with the customer throughout the entire process (as well as after), and their willingness to provide customization on the home of your dreams. TJB IS A FAMILY OWNED BUSINESS THAT BUILDS FANTASTIC HOMES FOR ALL WALKS Of LIFE! They built our beautiful cabin last year and we could not be happier. Top notch builders and a great company. Super energy efficient homes. They build an awesome house. I would recommend TJB to anyone who asks. I can’t describe how fabulous working with TJB has been. Building a home has always been described to me, as a horrible experience, with mistakes and frustrations. Once we contacted TJB, we knew immediately that building with them was going to be fun and enjoyable. TJB was always there to answer questions, and someone followed up with us frequently to make sure things weren’t missed. They were organized and on top of the process. This is a family run company, and they take great pride in the houses they build, and they treat their customers with respect. TJB also has the most beautiful houses, and the greatest quality! You won't ever regret using TJB. As one of TJB’s subcontractors, I can say TJB is great to work with. TJB builds only quality homes, never skimping to save a buck. Each of their homes is built with integrity so you end up with a home you’re proud to show off to your friends and family. You get what you pay for! Thanks for the beautiful arrangement! What a fun surprise to come home to. I wanted to thank you for all your help during this building process. I really appreciate your time, opinion and patience. You all were great to work with. The cabin is awesome and hopefully you can take a little business trip and stop by this summer. Loved working with TJB Homes. They built us an amazing home. We ended up doing their trade program and it couldn’t have worked out smoother. They worked with us to customize our home to our needs. We ended up taking one of their model plans, making the living room little bigger, as well as adding a loft area by making our master bath (which is super huge) slightly smaller. I would definitely recommend TJB and work with them again!!! I just thought I should send you a note about the neighborhood you created and the nice home that you built for us. We paid off the mortgage this past May! We love our home! You did a great job building it! Our 4 kids couldn't have had a better place to grow up. They are off on their own now, but all come home for the holidays. When we moved in here, there were 54 kids under the age of 10 just on our block alone. Now a whole new group is in and all new kids. We have a great neighborhood bike and social group called the "Tiffany Laners." Whether its St. Patricks day parties, New Years get-togethers, weddings, or Monday night social gatherings after long bike rides, we have a great time. Thanks for making the foundation for the whole thing! When we met with Jason to talk about building an addition to our home, he expanded on our ideas by asking questions and sketching possible results. He brought experience and creative suggestions that produced a building plan that we could visualize and matched what we wanted. Within a few days, he walked us through a detailed plan with a cost estimate, answering any question that we had. He provided a schedule that let us plan for the construction. Every phase was carefully managed to that schedule. From the moment that they broke ground for the basement, to the last paint touchups and cleanup, work was done both quickly and with precise attention to details. As with any larger project, changes to the plan did happen, but Jason worked with us to ensure there were no surprises. The skilled tradesmen finished the project beautifully. Every single person that we dealt with was courteous and respectful of us and our home. There is not a single part that we would have wanted to be done differently. Our addition is now a wonderful large, new living room with a vaulted ceiling, tall windows, and a fireplace to settle around with family and friends. We are so glad that we picked the right contractor for us. We strongly recommend to anyone who is interested in having an addition built - one that exceeds their expectations on time and on budget - that they call Jason at TJB Homes, Inc.
Hope you had a great trip. I wanted to pass along email that I sent to Justin. He has been great to work with (you all have). We so appreciate all the work all of your employees have done. You should be proud of the business you have. I just wanted to let you know how impressed Jay and I were at the walk-thru yesterday. As jay put it..."we have received first class service." I have been told by everyone I know that the end usually gets ugly and I SO appreciate you have not made it that way for us. Thanks for ALL you have done to make our house feel like home. After a crazy week of serious labor, we are moved in and settled. It feels great. I wanted to thank you all for your efforts. Jereomy - Hope we can find a renter. I heard rumor someone has applied. Let us know how we can help. Rob - Thank you for making it all work right at the end. Our sod looks great right now (because it’s so long it covers the seems). Have a safe and fun holiday! You change people’s lives! My wife Pranali said now this is what makes a TJB home. You make the houses special! The front changes plus the innovation around laundry, bath, and stairs are awesome. I’ll call to tomorrow. Thanks for the plan updates. A couple days after our closing and I’m feeling very fortunate, we’re living in a beautiful new home that was built by people I now consider friends. Thank YOU for making this experience so much fun and carefree; we’re almost sad it’s coming to an end as we’ve enjoyed all the time spent with you. Also, a very big part of why this whole process worked for us, were the programs you offered and Nate/Envoy’s ability to support those programs with their mortgage offerings. 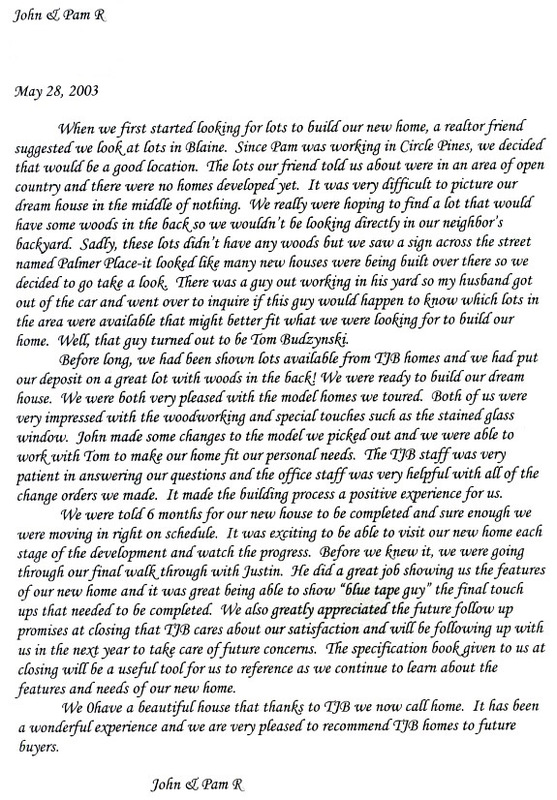 I just wanted to share that my experience with Nate was equally as amazing as building a home with TJB Homes. He went to great lengths and jumped through a rather long list of hoops to put us in a position to succeed. He did all of this while communicating frequently, in a positive and upbeat manner, and in a language that people who aren’t mortgage savvy understand. His team is equally as fantastic, all extremely friendly, yet very professional. They all made it look easy (I know it wasn’t), and inspired confidence in us along the way. What I’m getting at, is that I believe you are partnering with the gold standard when it comes to mortgage providers. The flexibility you offer in customizing floor plans and the care in which you treat your clients, combined with Nate’s ability to make it come together financially, is simply the best option for literally anyone looking to build a home. I will be an advocate, reference, and promoter of both TJB Homes and Envoy for a very, very long time. I hope you and Nate clearly understand what a positive impact you’ve both had on my family. We are really enjoying the new house. It suits our lifestyle perfectly. The big windows are great for views of the sugar maples and basswood trees behind the house. Life is much easier now that all three kids have their own room, and the upstairs loft works really well for the kids to play video games. I also want to provide a testimonial for your guaranteed rental program. If I had not found your guaranteed rental program I doubt I would have had the nerve to become a landlord. Not only would I worry about not being able to find renters but also that they would trash the house. In all likelihood if I would have just sold last year which looks like it was the bottom of this awful housing market. Conservatively I could have sold our house last year for $150,000. The market here rebounded so well over the spring and summer the value of that house increased 15-20%. The way I see it your program has already saved me 20-25 thousand dollars in equity in my home. Tiffany found really good renters for our property and they signed a two year lease. Between the extra money we make every month, the renters paying down our mortgage and the increase in value of the home we stand to come out ahead much better financially over the next few years. In closing I attached a few photos of the house. The kids were coming in from school as I was taking them so they have that "lived in" look. We all love the house! Duane and I just received our electric and gas report for our house and we are in the top 10 within 200 homes in the neighborhood on the efficiency of our house. I just thought I would say thanks for building us such a great house and so energy efficient. We couldn’t be happier with it and know you did a great job building it. Tom, I wanted to let you know we are really enjoying our house…even getting use to the small garage! Thank you again for the work you and your family did in getting us here. Last year was a "big deal" for us and we certainly appreciated the way you took us through the process and actually made it seem less a "big deal"-if that makes sense. Anyway, if you and your wife are in the neighborhood stop by for a drink. We’ve got the pontoon out on the lake, so, if it’s nice we can take a little ride. Steve, Jodi & Anna H.
I just wanted to take a minute to thank all of you for all you have done on my house project. There are a few minor issues to get sorted out yet but all in all its turned out very nice. So far I’ve only had a hand full of friends stop by the house and all are very impressed, lots of positive comments on details, view, cool neighborhood concept and workmanship. Jason, some have even made really positive comments on the cool sidewalk! I keep telling people that they need to wait until the landscaping is completed, garage is finished, house decorated and my collections displayed. The bar has been set high so finishing everything to that level will be a challenge but its starting to come together. Ron and I would like to say "Thank You to TJB" for the quick response on our 30 day punch list. Yesterday, TJB was at the house and took care of all the items on our list. All the work that was done was completed with great consideration and respect to our home and with experience. Thanks again, for all the great attention and customer service that TJB has applied to our new home. It has been a positive and rewarding experience for Ron and I.
lts been 10 months since I have moved into my new (Tuscany Style) TJB home. I wanted to give the home a "test drive" before making comments. The verdict, absolutely superb. The design, craftsmanship, and quality are more than even I expected. Over the past 34 years I have had the unique opportunity, as the CEO of Riccar Heating and Air Conditioning to work for hundreds of new home builders and for my company to install the HVAC in more than 14,000 new homes ranging in price from the old days of $75,000.00 to the most modern homes costing $3,000,000.00 +, So when it came to choosing a builder for my new home there was a lot of criteria that the builder must meet. Among this criteria was unique design. high quality, and good after the sale service. After much thought and consideration the choice was clear: TJB Homes. Did I make the right choice? You bet I did. Yourself Justin, and the entire TJB staff were a pleasure to work with. There was no detail to small for your staff to look into. During construction I was surprised several times at the exceptional quality of the materials being used and having Justin as superintendent on the job was a constant source of reassurance to me. Case in point. Justin and myself were touring the home one day when Justin noticed the kitchen center island was about one and a half inches to far to the right. I said to him "forget it, its no big deal". His reply was "you are buying a TJB custom home and its going to be right". He proceeded to get on his cell phone and call all four subcontractors needed to correct this small error. That I found to be very impressive. Tom, as you know, there are many fine home builders in the Twin Cities area. However in the price range that you build I would have to rank TJB Homes number one. It is my sincere belief that having the ’TJB’ name on the house number plaque will bring added value to the home at sale time, as buyers begin to realize that a TJB home is synonymous with quality. We wanted to let you know how much we are enjoying our TJB home and how much we enjoyed working with everyone at TJB from the purchasing process through the post closing touch ups. When we decided to relocate to the Twin Cities area neither of us knew the area so we looked at many builders in the north metro area and didn’t find any that could deliver as high a quality home as TJB. Everyone associated with TJB including your contractors was easy to work with and eager to make our home special and unique. All of our questions and concerns were addressed to our satisfaction without quibbling. TJB has innovative designs, pays attention to detail and takes pride in its product. TJB’s thoroughness is demonstrated throughout the building process from the comprehensive specification book to the final walk through when Justin identified more imperfections than we had seen after spending several hours inspecting the house the day before. Justin’s inspection was a final check that was started by the finishing crew that was already addressing imperfections they had seen. Finally, we were pleased our closing was on the date promised. Thank you again for such a pleasant and uneventful experience. Please let us know if our experience can help convince others to build a TJB home. We want to take this opportunity to thank all of you for the wonderful home in which we are now living. It is beautiful. And, it was easy. You and your staff did all the work. Becky and I had fun making choices. The entire TJB organization was a pleasure to meet and work with including subcontractors. There was always a pleasant voice and a listening ear when we had a question or concern. The office kept us apprised of costs so that at closing there were no surprises. It is by far the best building process we have experienced. I do not make these comments lightly either as I have built 7 new homes in the last 31 years providing me with ample experience in new home construction. We looked at a variety of builders before deciding on a TJB Home. TJB’s standard specifications show forward thinking to minimize energy costs and the impact on our environment. The plan we chose is refreshingly creative. Also, TJB’s attention to quality construction is the finest I have seen. You are the first builder who actually took the time to organize and compile a spec book that serves as a valuable resource for all our construction specifications, mechanical operating systems, and appliances. Tom, Justin, Jay, Becky, Sherri, Arlyn, Rick, Lance, and the rest of the TJB staff, thank you for a great home. We will definitely enjoy retirement here. Stop and say hello when you’re in the neighborhood. I could not be happier with my new TJB home. I really appreciate the prompt attention your staff gave to all my concerns. Justin and Lance were particularly helpful. Lance took care of all the minor details like little nicks in the paint and some sheet rock dust I found above some door moldings when we did the final walk through. Two weeks after I moved in I heard a strange beeping noise. I looked all over the house and could not determine the source. I called the TJB office and Lance was at my door within 5 minutes. He checked all the house systems and couldn’t find a thing. Then he looked in a toolbox I had in the furnace room and found an old smoke detector I had went off. I highly recommend TJB Homes to anyone thinking about a new home. My wife Faith and I just wanted to write to let you know how much we are enjoying our new basement in which you recently completed. The basement came out way beyond our expectations and we always look forward to showing it off to our friends and family. The entire process from Rick doing the planning to Hank making the finishing touches was completed very professionally and within 2 days of your estimated date of completion. After living in a TJB home for the past four years we knew we could not accept anything less for our basement refinish than the quality that we have come to expect from TJB. We had 2 other builders do comparison estimates and one of them was a friend and neighbor of ours. After he completed his estimate he admitted that he could not do it for any less than what you had offered and stated that your estimate was very competitive especially considering TJB’s reputation for their quality. I will be more than enthusiastic in the future for anyone looking for a reference on TJB Homes and ensure them that they will only be settling for the BEST if they choose you for anything they may need to enhance their quality of life. The purpose of this letter is to express our sincere appreciation to you for building our new home. We are very thrilled, how great our home turned out. When we took the possession on October 12, 1999, our home was immaculate and everything was in perfect and working order. You have not only met our expectations, but by far have exceeded them. We appreciate all your ideas and suggestions, and how well they worked out. Your great attention to every detail made our home very unique. I’m happy to report that after occupying our home for a month, we still would not change a thing. We do realize that your wonderful staff played a major role in making all this happen, and we would also like to express our gratitude to all of them. We greatly appreciate all their hard work and their handling of all matters with professional courtesy and promptness. Both Lori Gott and Paul Alsides not only help us purchase our new home; they sold our old one as well. They were very supportive and made all the transactions seem very easy. We are very appreciative for all their assistance. Sherri and Arlyn were also a joy to work with. They were always helpful and took care of things in very cheerful and professional manner. They kept us well informed of all the scheduled jobs, and we felt comfortable in contacting them with any questions. Big thanks to the rest of your staff, for all their excellent and hard work. With Thanksgiving just a few days away, I’m very happy and find it appropriate to send you this "Thank You Letter". Our beautiful home that you have built for us, is one of the things that we are thankful for this year. After spending our first two weeks in our new TJB Home we still have to pinch ourselves that our dream of owning a home of this magnitude has finally come true. After deciding that we were going to build a new home instead of buying a preexisting one we interviewed several builders and looked at their models and the more we looked the more frustrated we became. It just did not seem we were getting the kind of quality and that ever so important WOW effect that you would expect in this price range. I just knew our luck had to change soon or we would remain in our old home a couple more years. On a beautiful Saturday afternoon in July I was out for a motorcycle ride in the area we were hoping to build when I just happened to come across an open house sign. I followed the signs to your model home in Oak Run Shores in Oakdale, MN. As soon as I stepped into the front entry way I fell in love with this home. My first thought was this is going to be way out of our price range but the when the Realtor Paul Alsides went through the features of the home it became clear that for the money this was a top of the line quality home with that WOW effect we were looking for. I rushed home to pick up my wife and bring her back and she had the same reaction as I had when I first stepped into this beautiful home. With an existing home to sell first and with new homes being bought up so quickly we didn’t think we had a chance to buy this new home that we fell in love with. Paul assured us that if this is the home we wanted he could make it happen not only with the down and monthly payment we needed to be in but also the time frame we had to work with. It seemed like an impossible task for him but he accomplished everything he said he would. We will always strongly recommend TJB Homes and Paul Alsides to all of our family and friends. This was our fourth home purchase and it was by far our most positive and stress free experience we’ve ever had. Thanks again for making our dream come true. 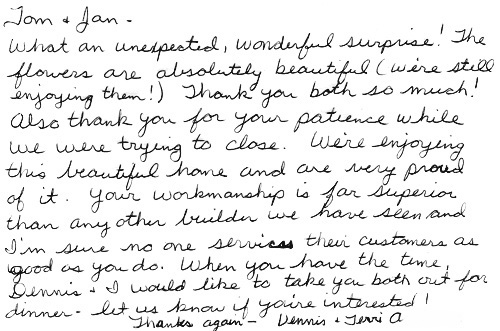 Many, many thanks for exceeding our expectations in the quality and style of the home that you recently built for us!!! 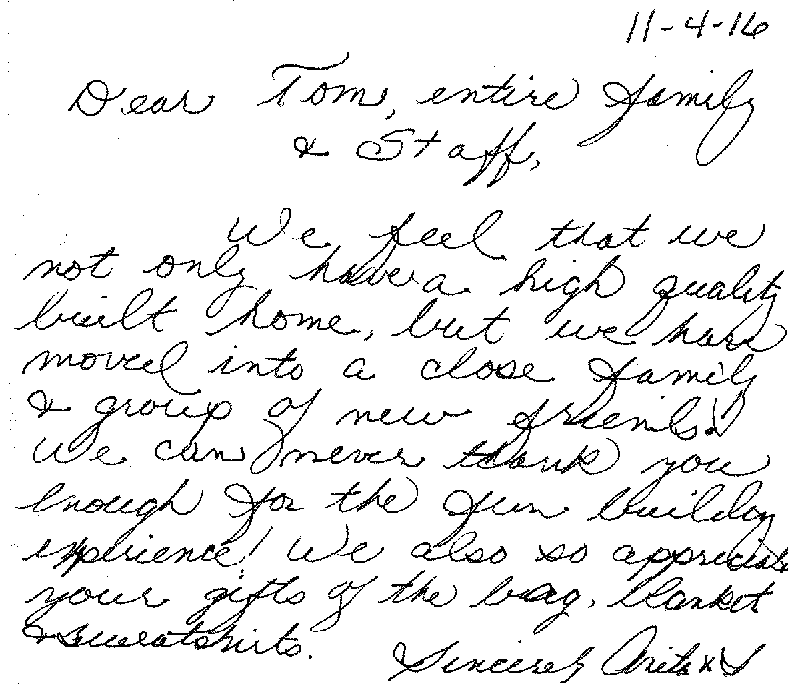 Tom, your attention to detail was appreciated, and ’We were very fortunate that you provided us numerous ideas that we had missed in our initial home design. Though our home was a common design that your company has obviously mastered, small, intricate changes made our home unique. Our only suggestion is that documented pricing for upgrades would make the specification process less confusing. However, the specifications book was very complete. Ease of Completion/Interaction From the initial home design to completion, we felt our project was on autopilot, with minimal monitoring needed. While our friends building homes were at their site each day keeping tabs on their builder and struggling through misunderstandings, we only felt we needed to visit out of interest. We had the confidence that you had everything well planned and under control. We must complement the attitudes of your employees, especially Arlyn and John. Our questions were always answered promptly and any concerns handled immediately. Without a doubt, our initial experience has been that the quality of your homes is unsurpassed by any of the other builders in the northwestern suburbs. We have had very good experience thus far with the follow-up work of your subcontractors, who have been prompt to return our calls and follow-up with their responsibilities. Finally, there is a laundry list of items that you include in your base pricing that are upgrades with other builders, or not even offered. We have heard other builders use the cliche "your builder for life", but, like your other customers - we would never hesitate to recommend TJB to our friends and co-workers, and will always keep you in mind for remodeling and future changes. Ron L. & Hope H.
We would like to thank you and all your staff and crew for the wonderful experience of building a new home. In spite of the many horror stories we had heard about the process of building a home, we decided to take the plunge because of the good things we had heard about TJB. One of the biggest deciding factors in choosing TJB was that we had heard that you were very particular about your homes and that you made your rounds to the various sites on a very regular basis. Knowing that you were overlooking each step was very encouraging to us. We expected near perfection, and we feel we got just that. The overall process went very smoothly. Any questions we had were very willingly answered by Arlyn. She was very helpful and knowledgeable about each and every step of the process. She was on top of the project from beginning to end. We would also like to express our thanks to her. The trade-in program you offer gave us peace of mind. Knowing that even if our house didn’t sell in time before moving into the new home, we still had the house sold no matter what. Working with Mike and Michelle from Remax during the process of selling our first home was a pleasure. Their sending us updates on a weekly basis to let us know the status of the showings was very encouraging. They too made the selling and building experience more enjoyable. The final walk through with John was very informative. He gave us a great deal of information on all aspects of the new house and how to operate the heating system, gas fireplace, windows, etc. He also took care of all of the final touches on the walls and other last minute projects so that on closing day we walked into a beautiful new home. All of the people we had contact with at TJB were very nice to work with, and they made this a wonderful experience for us. Tom, please feel free to use this letter for prospective customers, and if you wish to show our home to prospective customers, please feel free to give us a call. We have been in our new TJB home almost three months now and are enjoying it immensely. Looking back over the process of building our home, we consider it a very positive experience. We must admit that after talking to others about building a new home, we did not always get a positive response. Many of our friends and acquaintances had built previously and found the process very stressful, and would never do it again. So, we did proceed with some reservation. We are happy to report that we will always look back on the past six months as a very enjoyable time in our lives. We were out on the site almost daily to watch the progress of our home. We were very impressed with the subcontractors, especially the framers, who really knew how to work hard. Things seemed to move right along and our home was actually completed a month ahead of schedule, almost unheard of in the construction business. We had many questions along the way as this was the first home that we built. The people in the TIB office (Arlyn and Sherry) were always there to answer our questions. They were always there to keep us on schedule in making our choices. When they weren’t available immediately, we could expect a phone call promptly. Their knowledge and expertise were exceptional. There are many decisions and choices to be made in building a new home. When we would forget exactly what we had ordered or were unsure of some other aspect of the building process, we found the comprehensive specification book extremely helpful. It contained a multitude of information that we needed almost on a daily basis. It continues to be helpful as it contains addresses and/or phone numbers that we occasionally need now that we are in our home. The final walk-through was helpful as Carl explained "how things work" in our home. He has been very easy to work with and it is very obvious that he "aims to please". He has been back twice since closing to do some finishing work and to fine-tune a few things. We have been quite pleased with the follow-up of some minor concerns. Lastly, we really want to thank Tom for overseeing the whole process. Although we did not see him a lot, he was available when he needed to be. It was amazing for us to see what goes into building a new home, the number of people that need to work together to make the final product a product of excellence. We feel that our new home is a quality-built home and hope to be able to enjoy it for many years. Thank you TJB for making the process very enjoyable and memorable for us. If we are ever needed for a reference or recommendation, don’t hesitate to call us. 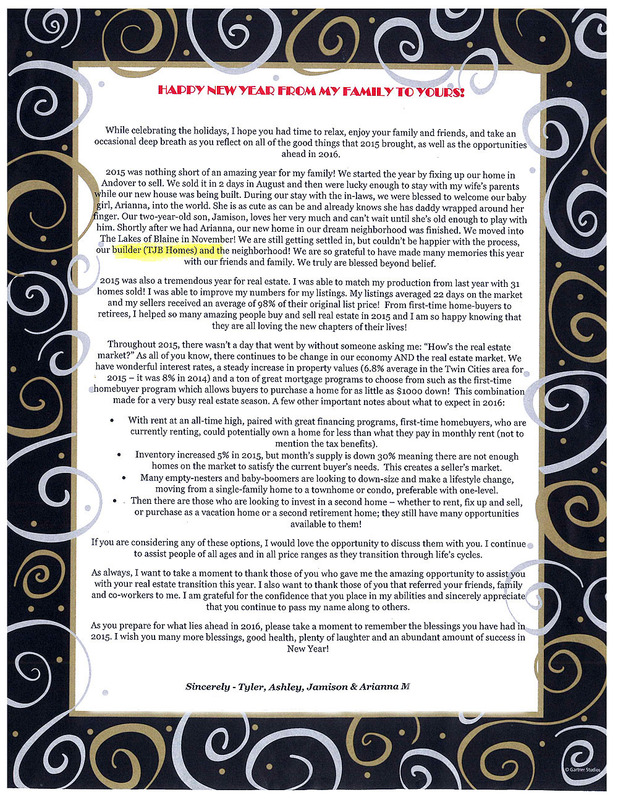 Please find enclosed a letter in regards to our home buying experience with your company. Being in the Mortgage business for the past 10 years I have heard literally hundreds of "horror stories" about new construction that caused some hesitation about pursuing it. I must say that we were pleasantly surprised with the experience. We found the process to be very "painless" and actually easy. We purchased a Model Home that we requested some substantial changes to and TJB Homes was more than accommodating. I was especially appreciative with the final walk-through, it was very-thorough and Carl was even more discriminating than we were. I must also comment on the service after we closed. When we sent our list of things that we either missed during the walk-through or developed after we moved in, TJB Homes (Carl in particular) were more than happy to provide friendly, prompt and precise service. 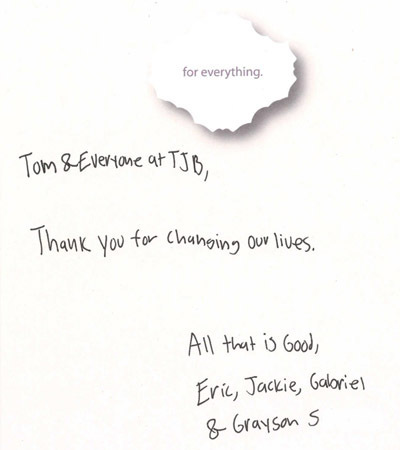 Many thanks to you and your entire team at TJB Homes for making our home building experience a positive one. We have occupied our new residence for about two months now and I am pleased to say that without exception it has met our expectations. Each and every one was thoroughly committed to complete customer satisfaction both during and after the job. I will say that in multiple instances their response to our requests was remarkable. Linda Fitzsimmons could not have done a better job in assisting us with the selection of our carpet, tile, paint and countertops. Each selection flows with the next. Her patience and commitment to perfection significantly contributed to our end result. Both John and Karl were committed to perfection in the preparation our home for occupancy. No detail was deemed insignificant. In the words of John "If it’s important to you, it’s important to us". Finally, our thanks to both Arlyn for her responsiveness throughout the entire process. 1. A deciding moment for us to select TJB was when Tom came out to the lot we had selected and walked it. Making sure the house we were talking about would fit, the angle of the house, and other elements to maximize our view of the golf course located directly behind. 2. We love Arlyn!!! I say it again, we love Arlyn!!! She was wonderful throughout the entire process. She got things done, great follow through, and knowledgeable. 3. We love John! We were so impressed with the meticulous detail nearing the closing. We never expected the house to be so perfect when we moved in. 4. The added value elements inside and out make this a home we are proud of. Suggested changes by Tom during the process further enhanced the living spaces that could have never been thought of on a blue print. 5. We thought the subs used on the house did a great job. We had an opportunity to meet most of them and they each took care and pride in the job they were doing. We are really enjoying our TJB home. Thank you! We have gotten settled in our house in the past few months and I wanted to take the time to thank you and your WONDERFULL staff for our new home, we love it! As you know, we did not choose the easiest building site, but once the permit was in hand it was exciting to see how quickly things progressed. Arlyn and Sherri were so helpful in answering questions and processing our change orders. No matter how often I "bugged" them, they were always friendly, helpful and timely in getting the answers we needed. They were absolutely the best to work with. Having good people is a key asset. Along with working with Arlyn and Sherri, John was great too. I was surprised by the detailed final walk-through. John took the time to answer any questions as well as go through things from running the VanEE and humidifier to operating window screens. His attention to detail was important to us. Being happy with the final product was the most important part of building this home. We are enjoying the house and the lake and want to thank you for being an important part of it all. The home is beautiful in and of itself -- care was taken to design the house with interior and exterior landscapes that are wonderful: serious attention was paid to small and large details, such as curved oak trims, stained glass windows, distinctly shaped windows, lots of fun amenities, etc. The quality of the home is outstanding: every builder and contractor who has been through the house has commented on the quality of materials used throughout. In particular, they are very impressed with the "crawl space" between floors, the VanEE, April Aire, and the high ceilings. The home was used as a model home for over a year, prior to our purchasing it, and as a result, there were a few things that needed some work to be put back to "brand new" status. The service provided by the builder was exemplary: courteous, prompt skilled experts who made every effort to accommodate our needs and schedules. Every correction on our list was handled not only with a great attitude, but with alacrity. The walk through at possession was extremely helpful. We were shown not only where everything was and how it worked, but given lots of helpful advice on how to get the best performance from all aspects of the home. We would recommend you as a builder to anyone who wants a quality built home that is well thought out and designed with flair and charm. We cannot speak highly enough of TJB Homes, and the services they provided. Arlen was always a joy to work with and I commend her for her incredible organizational skills. Because of her constant follow-up with the various sub-contractors we were able to move into the home in mid December ’96. This never would have been possible if Arlen did not always crack the whip when needed. Another quality that we really admired was her responsiveness to follow-up. She would always promptly return our calls and get answers to our questions. Although, sometimes we called with ’obvious’ questions, she always took us serious and helped us in a very friendly manner. Outstanding job!! John always impressed us with his incredible attention to detail and outstanding work ethic. He was at our home at all hours checking up on others, cleaning messes, installing the wonderful doggie doors and just ensuring that the construction of the home would exceed our expectations ... and it certainly did!! Another quality that we really admired about John was his patience and conunitment to us. He always took the time to explain how to operate items or to provide advice as to how he would do things. Thanks for the many cleaning tips, the carpeting still looks great after the dog messed it! A rare quality that Tom possesses that many owners do not have is that he listens, is honest and very direct. All qualities that we admired and because of him we have a beautiful home. Tom works with each new homer and customizes the home accordingly rather than just building it how he would like it. Once again, thank you for making our building experience a positive one. We really enjoyed working with all of you and appreciate your commitment to quality. We just wanted to drop you a note to thank you for working with us so closely during our home building and to share our appreciation for our wonderful new home. As you know, we hoped to be in our new home by November 7th, 1997. Your team, it seems had someone at our home almost each and every day to ensure our timeframe would be met. Additionally, many new homeowners talk about the stress of building a new home. To my delight and surprise not once did we feel that way. To the contrary, everything went very smoothly, from the assistance provided in picking out the lighting fixtures, to flooring, to the skill, care and professionalism of those who worked at the property. Just one final comment, during the construction a friend had stopped by to see our new home said "you can tell quality when you see it". We couldn’t agree more! We just wanted to drop you and your group a note on how much we love our new home and the professionalism that your group demonstrated to us throughout the build and after the close. I cannot tell you how very impressed we have been with the entire group at TJB. When we talk to others in our development who built with other builders your name often comes up as people say "we wish we would of built with TJB". Every step of our building process was fun and easy. The subcontractors that TJB works with were wonderful to deal with. We had a problem with our lighting and was great in fixing our entry light and even came out to the house to at we were getting a light we would be happy with in the long term. Arlyn and Cheri in the office were fabulous in answering our many, many questions and were great at explaining why things worked the way they did. John was outstanding in our final walk through. It was more of an education into how everything works verses here is what needs to be fixed. All issues that have come up have been fixed, explained and taken care of in a efficient, timely manner. We cannot say enough about the tremendous positive service we have received with TJB Homes. Your staff has been great to work with, they are worth millions!! Thanks again!!!! We would like to thank you for an excellent building experience. Whenever we would tell people we were building a new house, most would frown and say "good-luck". It appears that most people have had bad building experiences and horror stories to tell. With TJB, however, we always knew when things would be completed and when the final walk-through would take place. The contractors were not "scrambling" at the end to get the house done on time. Instead, they had the time to do it the "quality" way. Others in our neighborhood have had to push out their closing date which can be very difficult when you have young children as we do. Thanks again for the beautiful house. We definitely would build again with TJB if we ever decide to move. "Hi! I’m sure you don’t remember us, but you built a house for us 10 years ago in Shoreview on the corner of Royal Oaks Dr. and Lexington. The value of the homes in our area have increased dramatically and we are just thinking about the idea of selling and building again. We have gone to several parade of homes and have yet to find a home that beats a TJB home. In fact, we were in Lino Lakes and saw the Cassandra, Alexandra and Becky Sue. Realtor Joe Lukic showed us the other homes you had there. We would like to stay somewhat in this area and would like to stay under $300,000. It is just Frank and I, girls are grown and gone, but would like 3 bedrooms. We really loved your homes. Many unique things!" "We were amazed at how fast the construction went and that our home was completed before scheduled." "With TJB, we went from initial visit to closing in less time than it took to get another builder to give us a price on an air exchange system. From start to finish, our needs and concerns were heard and met. Tom is true to his word and committed to quality. Today, these are two qualities that are missing from too many facets of our lives. It is refreshing to find truth and honor in a high dollar business." "Overall, your organization and experience made Meg and I feel comfortable with building our first home with you. Thanks again for a wonderful experience and a BEAUTIFUL home." "Everyone involved in the planning of our home were very helpful. They were very imaginative in coming up with very special items to make our house plan unique. As the building process began, we could tell that TJB Homes employs only the best craftsmen for their homes. All of the workers were more than happy to answer any and all questions that we had during construction.. .we would highly recommend TJB Homes to all of our friends." "It is important to be able to easily get ahold of your builder and when you do, to find helpful people willing to work with you to get you what you need. This is what we consistently found with TJB Homes. Your willingness to work with us was very much appreciated." "We have lived here three short months and we feel like it’s HOME! TJB has done call-backs to make sure we are content. They are still considering us "clients" long after the job is done. That is why we feel proud to boast, brag and speak wit enthusiasm about our new home...and of course about TJB!" "I just wanted to let you know that in my dreams I never thought building a new house would be so easy and hassle-free. From the very first day, we sat down with you to choose which home to build right up to the closing, you were always available to answer any questions or concerns.....Thank you for such a wonderful home!"